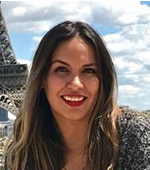 LRDC graduate student Gabriela Terrazas Duarte received a fellowship to the 2017 Kavli Summer Institute in Cognitive Neuroscience. Each year, the Summer Institute assembles a faculty of distinguished investigators and a group of young, promising scholars (fellows) that represent the many disciplines that bear on the mind-brain sciences. It has become one of the most prized opportunities for promising graduate students, postdoctoral fellows, and young professors and research scientists.